Peanut allergies as a disability? I do not consider my son to be disabled. He does most everything ten year-old boys do. He is an excellent baseball player and has dreams of playing in college or the big leagues. He is a fiery ball of incessant energy and commotion. You would never know there was something different with this boy just by looking at him, except for perhaps the Medic-Alert bracelet he wears because of his life-threatening allergies to peanuts and tree nuts. Five years ago, several women at a San Diego law firm with a passion for community service got together to discuss ways they could help the homeless. Historically, the world of financial planning and investing has been male-dominated. Based on a variety of surveys, 75 percent of financial planners, 80 percent of brokers and an astonishing 93 percent of hedge fund managers are male. As a result, many of the services and even sales tactics developed by financial institutions to reach and attract high net worth individuals have been done so through this masculine lens. Lawmakers appear close to finally passing patent reform legislation, but the process still has a few obstacles to overcome. 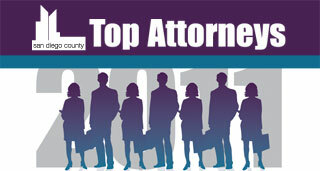 Top Attorneys 2011 pays tribute to San Diego County's legal cream of the crop. It is the culmination of a lengthy peer voting process that began in March with the announcement of a call for nominations. San Diego County lawyers were asked who among their peers -- with whom they had professional experience -- were worthy of recognition. Thomas Jefferson School of Law is proud of its professors who made this year’s Top Attorneys list; however, we consider all of our professors to be “Top Attorneys” in their areas of expertise. The heart and soul of our law school is our faculty. These world-class educators stay ahead of the curve in the areas of law relating to technological change, globalization and the transformation of our social order. From Fulbright Scholars, to respected authors, to sought after experts, our faculty is comprised of amazingly productive scholars who bring years of valuable professional experience to the classroom and to their areas of expertise. Is patent reform bad for business? On June 23, 2011, the U.S. House of Representatives passed House Bill H.R. 1249 (the Leahy-Smith America Invents Act), following Senate approval of bill S.23 (the America Invents Act) on March 8, 2011. Thereafter, President Obama indicated that he will sign into law the patent reform bill that arrives on his desk. When John Gomez founded Gomez Law Firm six years ago, he envisioned a business that would not only make a difference in the courtroom, but also in the community. When Frederick Fish founded Fish & Richardson in 1878, luminaries of the 19th and 20th century turned to the firm for legal assistance in patenting some of the most significant inventions of the times, including the Wright Brothers’ flying machine, Alexander Graham Bell’s telephone and Thomas Edison’s light bulb. The company’s tradition of representing entrepreneurs with innovative ideas and a drive to succeed continues today with clients such as Biogen Idec, Google, 3M and Callaway Golf who look to Fish as a legal and business foundation for innovations that will undoubtedly change the 21st century. At California Western School of Law, pro bono work is more than just a requirement of the legal profession, it’s a proud tradition. July 15 (Bloomberg) -- Apple Inc. won a U.S. International Trade Commission ruling in a patent-infringement case targeting HTC Corp.’s Android-based mobile telephones. For a moment, I wondered if my phone had gone dead. 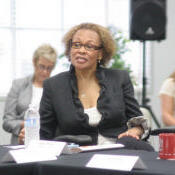 While women have made great strides in the legal community throughout the years, some barriers still remain, according to a panel of female attorneys recently hosted by The Daily Transcript and sponsored by Union Bank.